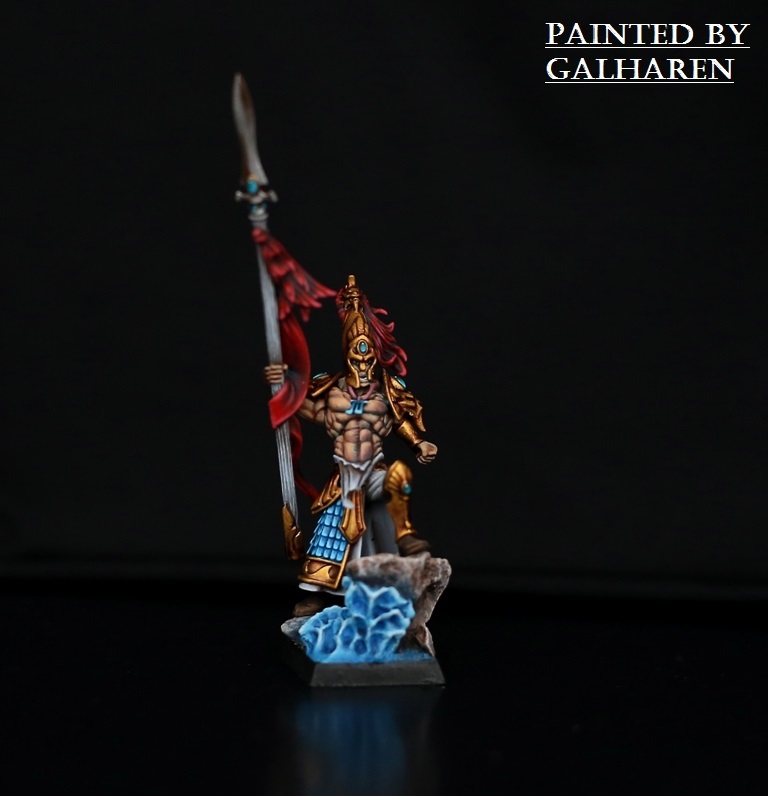 Ulthuan • View topic - Galharen's works - 28.12.2018 "Last Elf Standing!" and our uberspear build reminds me of some Tolkien elves. The big one was Fëanor I guess, though he bit off more than he could chew! The first Glorfindel fought a Balrog at Gondolin. Fingolfin was the real badass. He duelled Morgoth! There was a few duels between elves and balrogs described. Feanor was indeed the big one, who fought a bunch of them at a time. Glorfindel another. And Ecthelion who fought Gothmog at the fall of Gondolin. For me, the Fingolfin and Morgoth duel was the most epic one. I guess no-one, not even Gandalf survived duelling a Balrog, though he did return, as possibly did Glorfindel? 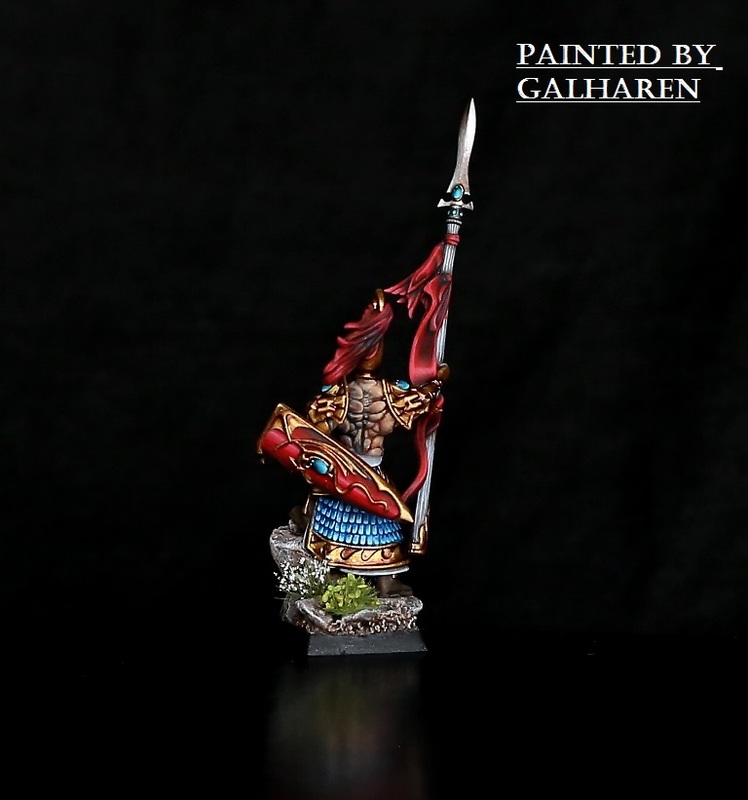 Today I want to present you an update of my new general for my private Highborn Elves army. Heavily insipred by Achilles and Leonidas from 300 movie, I called it "The Last Elf Standing!" There are still some missing parts, I need to finish his shield as well as the base. 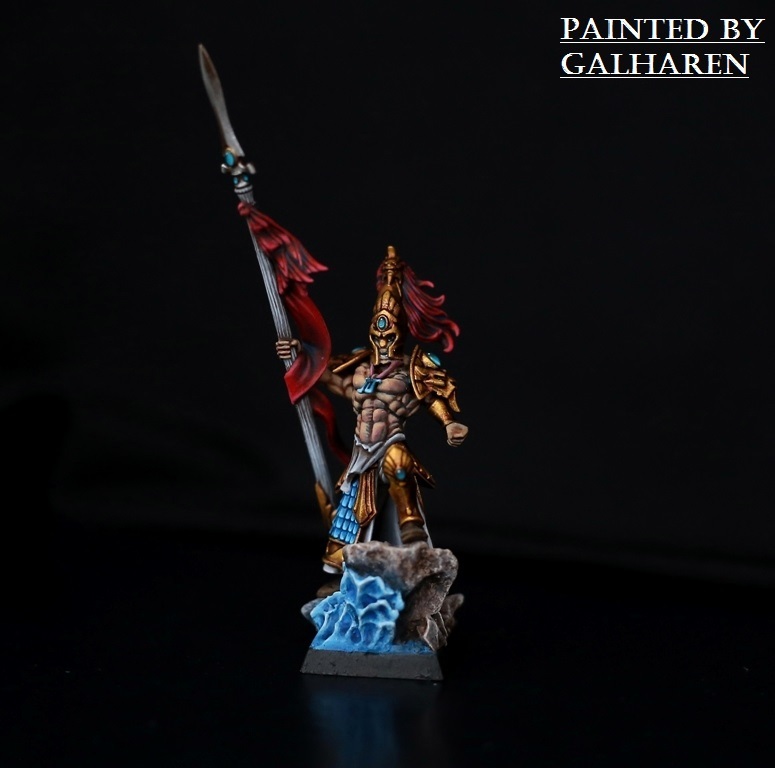 Post subject: Re: Galharen's works - 28.12.2018 "Last Elf Standing!" The colours are so striking Galharen! Remeniscent of Aenarion too, for me. I love him. The gold / bronze has a very ancient or greek feel to it somehow. And I just love your reds. What's your magic recipe for the shield? Indeed. Never thought about it. But dueling a Balrog seems to be a deadly occupation. As for Glorfindel, I think it was never fully solved if it's the same elf or a different one between the Silmarillion and LotR. 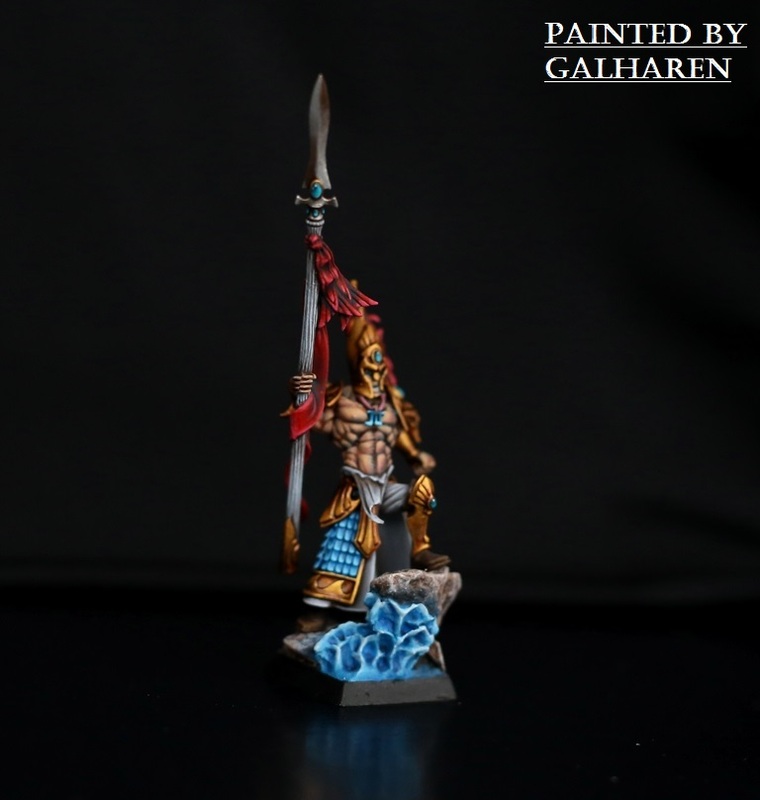 If I would have to critique something, the water flowing around the base of the spear guy looks a bit off. At least, in how it flows around the rock. It doesn't feel completely natural to me. Perhaps it's the "ridge" in the middle that does this, not sure. For some reason I feel the Korhil was born to fight Throgg the Troll King! I can’t help thinking of Beowulf too. Cool muscles ). Nice as always man. Nevertheless, I present you my new unit of shadow warriors / grey watchers. 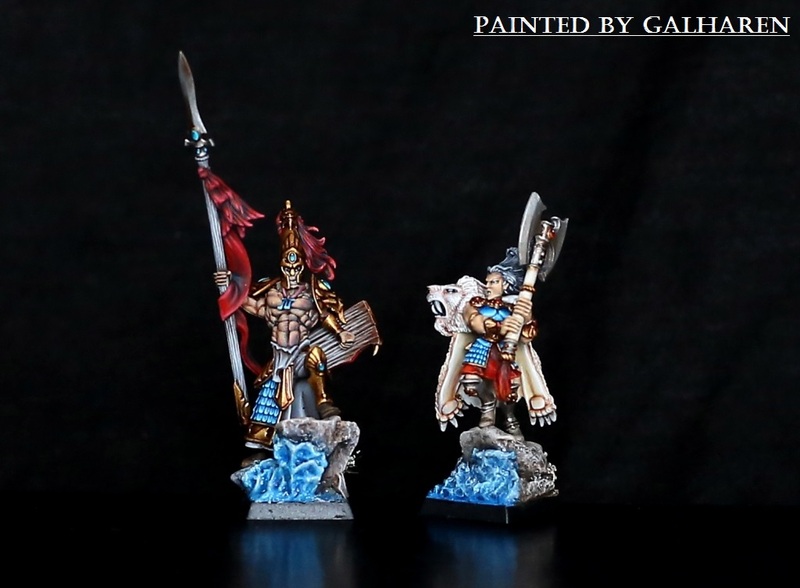 It was fun to paint them, I like the colors scheme - how about you? Loving them, what else =), but did you use true gold in there and the buffed up ''elfspartan''? Thats new i believe! I think they are very colorful for a unit called "grey watchers"
I like them a lot. The new colorscheme is great. The green, brown and gold works very well together. As does the blue spot-color. The make for a very badass looking scout unit. And the bases are great as well. They are orginal, dynamic and help the unit pop. Well done I'd love to see more. There is nothing anonymous or ignorable about this piece. 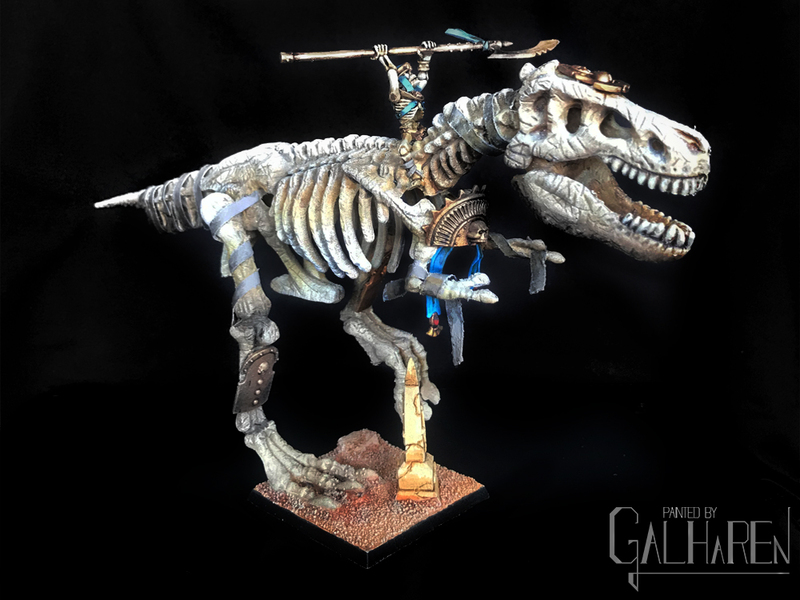 Man, I'm looking for commission painter! Go for the plastic dragon princes! They're models where it matters a lot how they're painted I think (or rather, I really dislike the default GW paintjob on them). So I'm curious to see what you can do with them. Or better yet, never do the dragon princes and spend your effort on something more worthwhile . Just kidding, really looking forward to whatever you do next! Seriously Galharen, after those archers I think you should do an Avelorn-style army, it’d look amazing. I’m sure you remember Gray’s thread? Sadly we seem to have lost the pics. Oh yes, I remember that army, simply amazing! But it would be too much for me to make an army with the new color scheme.